Mother's day has always been an excellent excuse for brunch, which is the meal I thought of when I laid eyes on this eclectic and organic dining space. I originally saw this room on one of my favorite daily reads, Coco + Kelley, and was drawn to the fresh peach walls, Ikat pillows and stunning driftwood table. Even the place settings and flower arrangements make me want to gather with loved ones around a plate of bagels and lox. My beloved 8 year old Lhaso Apso mix, Chopper, is undergoing back surgery this morning for the 2nd time in 2 years. Words cannot express the stress and heartache I've felt ever since I noticed he wasn't walking right last weekend; I would gladly undergo surgery 1,000 times if it meant he didn't have to. Fluffy (as I call him) has been my greatest love since I brought him home one summer day in college. With that said please keep Chopper and his recovery in your thoughts and prayers. he`s so cute! hope he`ll be alright! And, your dog is in my thoughts - hope everything goes smoothly!! 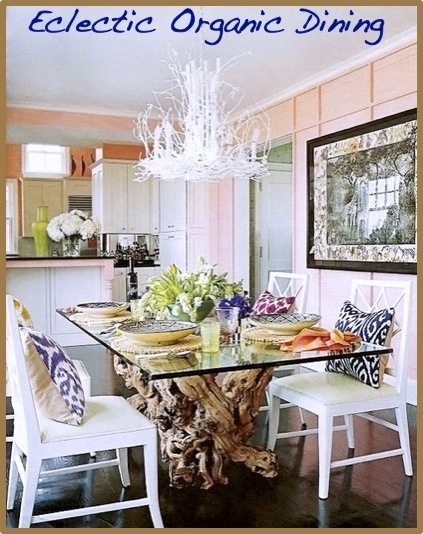 That dining room is beautifully dynamic - I had never considered peach walls but they look so fresh!!! I love it! And that table is incredible! Sending you and Chopper good thoughts and and good vibes!!! Sending positive vibes to Chopper!!! 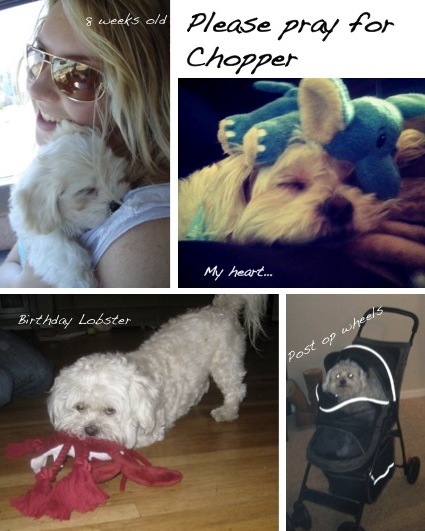 Aww I'll definitely be thinking about Chopper today, obviously he means so much to you... He is a cutie! I love the combination of peach walls and driftwood - they go so well together! And I will always be into ikat... What about it always makes it look so dang good!? I'll keep your pup in my prayers sweetie! It's tough to go through something so traumatic... my 12 year old terrier is as close to family as they come! Good job girl! Claim that name and domain! Excited for your new ventures!! Love the bubble gum skirt and necklace with the nautical stripes! My wardrobe staple are definitely my black sude report knee high boots. In fact, I'm wearing them right now! Hope all is well with you sweetie! And thank you for your sweet comment! The perfect home will come along soon! Waouh, love the table on the first pic, so cool!! That dining room is gorgeous! I love the table & chandelier. I hope Chopper is ok. I'm so sorry about Chopper! I hope he pulls through! Keep us updated! Oh!!! !I wish to Fluffy all the best !!!!!!!!!!!!!!!!!!!! Hi just came across your blog, its fab very inspiring and How cute is your dog. I'm make up artist and just getting back into blogging if you get a chance to check it out. Just going to join yours now. I hope Chopper is okay! I hate when my doggies are sick...it just breaks my heart. I'll be keeping him in my thoughts! I just love the dinning room, and the table is amazing! I hope you dog gets better!Best wishes. I love the table and I'm so sorry about your dog. He's precious! Thanks for your comments on the summer sandal post. I'm loving those Sam Edelman's also! I hope your dog is going to be alright! I totally know how you feel. My dog started to get seizures back in winter and it was one of the worst things that have ever happened to me. He's ok now thank god. OMG such an adorable pup! LOVE LOVE LOVE!! !